Aren’t we all a fan of those heroic stories? You know, the Arthurian, Herculean, Supermanian kind of supernatural achievement, beating all odds and defying people’s naïve expectations. This is my analogy towards start-up inspiration. Yes, lately, apart from travel, and expat life, I’m starting to eat up some start-up crusts, all thanks to my blood-bro and bro-friends who are diligently injecting in some inspirational IV juices lately. Start-up success stories and getting to know leaders who have been doing, are doing, and who are about to do it are getting into my (good) nerves these days, and I couldn’t help but notice this Filipino start-up company that’s inspirational in so many levels. I’ve chanced upon their website, while I was looking for some good Pinoy travel finds. It’s a little surprising that, unlike in Europe and in some countries in Asia, there aren’t exactly any online bus reservation type of scheme in the Phils… considering that Filipinos are into travelling that much. This brilliant site saw that need and is now backing the idea up! Co-Founder and CEO Au Soriano, after 20+years in corporate Telecommunications industry, moved on to fulfill her dream to be an Entrepreneur, through launching and sustaining an online bus reservation business. As a traveler, I fully support this thing! A BIG KUDOS to this group for coming up with this idea, because this is not only a need and but also a BIG PLUS for the Philippines if this goes into full scale, just like in first world countries. I reached out to their team to get some quick insights about their plans and opportunities, and Au was very gracious enough to accept and share us some insights to their Herculean inspiration of an endeavor. Be sure to check out their website for blog posts and updates on their latest bus partners. It’s fun to travel in the Philippines, and it’s not strictly for airline’s sake. 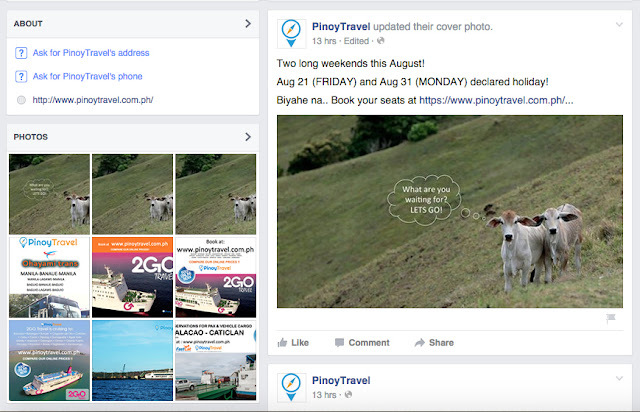 Bus travel is a really good option too, all thanks to the Pinoy Travel PH site. Bowdy: How did you stumble upon this great idea? Au: I was born in Bauang La Union, and growing up, my family of 7 kids would often travel from Bauang to Manila and Pangasinan, where my father worked, by bus. So i knew by heart how the system works. Years later we moved to Manila and we stopped traveling that often. In late 2012 i passed by a bus terminal and noticed that people still travel the same way - despite the smartphones and tables in their hands. That told me that its time to change do whats already happening in other countries. Bowdy: What’s the most important thing you’re working on right now, and how are you making it happen? Au: I am finding ways to convince ALL the provincial bus companies to fully embrace technology solutions make their passengers buying experience better. How? Patience and determination, and a lot of PR. Bowdy: How far are you / or your team is willing to go to see your idea become a success? Bowdy: How do you see the Philippine Start-Up Landscape? The Good, The Bad, The Funny? The BAD: After being convinced and after leaving school or a career to run your company, you are suddenly on your own. There is very little help on how to operate and grow your business. Creativity and innovativeness - which is what everyone looks for at the start- is practically useless once you start dealing with SEC, BIR, and other government agencies that regulates your business. The FUNNY: If you want to do everything right, half your money will just go to lawyers, accountants and auditors. My biggest costs: Number =1: salaries; Number 2= taxes. All these when my gross revenues is not even enough to cover the salaries. Bowdy: How has the startup impacted your family, social life, or relationships? How have you changed as a result? Au: I came prepared. My 20+ years in corporate gave me the network, experience and financial stability to explore without sacrificing my family’s quality of life. Family relations is better because i get to work from home most of time. so I get to see my kids more. i think i am also inspiring my daughters to take the science and tech path as well. Yes i have changed a lot - during my corp life my wings were clipped which made me unhappy and insecure most of the time. Now that i am in control, i accomplished more and i became more confident and outspoken. It also gave me the confidence that i can do even bigger things in the future. Now i feel like i can really help fix many of the problems in our government. Bowdy: Any advice for people who would like to venture out in a start-up industry that’s related to travel? Au: There may opportunities in the public transportation aspect of travel in Ph, but be ready to deal with traditional thinkers and a lot of government regulations.